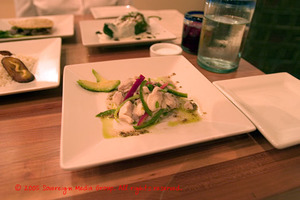 From the Antojitos (or Small Plates) menu, we ordered several dishes to share. Queso Fundido ($7) is a delicious, oozy mass of Oaxacan cheese, topped with chorizo and served with dense, almost creamy corn tortillas. This was very good, though my least favorite dish. Ceviche ($10) was wonderful, and everything ceviche should be. Not overly sharp, with a nice amount of heat from Serrano chiles, this fish was dressed with a surprising spice -- crushed coriander. I found the combination completely inspired. One of my favorite dishes was the Mulitas ($6), grilled Niman Ranch steak, melted cheese, guacamole and salsa fresca sandwiched again between those amazing palm-sized tortillas. At first taste, these seem almost overly simple. But then the flavors meld in your mouth, and become the most subtle but perfectly flavored bite. 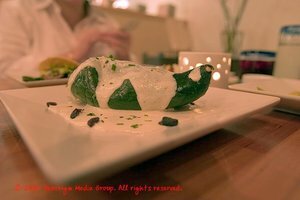 We also ordered one of the evenings specials, Chile en Nogada ($13). This was my favorite dish at Guaymas when Guaymas was still good, and I've missed it dearly. Tamarindo's version sated my craving nicely. A large poblano chile was stuffed with sauteed ground beef, walnuts and nectarines, then dressed with a walnut-cream sauce. The dish was served cool, which was different, and I think I prefer it served warm. Still, though, all the nuances of the walnut sauce came through, and the sweetness helped to cut the building heat of the poblano. Altogether a successful dish. 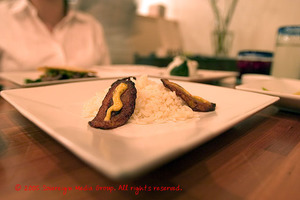 Finally, from the Guarniciones menu, we ordered the Arroz Blanco con Platanos Fritos ($3), a small plate of fragrant and tender rice topped with three slices of fried plantains. I loved having the rice to cool our palates with when the spices built up, and what's not to love about perfectly cooked plantains? For dessert, we had Arroz Con Leche ($6) and a Cajeta Crepe ($6). The rice pudding was ok, but I'm not sure I'd order it again. It was VERY milky (more like a sweet rice soup, really), and rather too heavy-handed with the cinnamon garnish. On the other hand, the crepe was a total winner. As C said, the cajeta had amazing depth of flavor without being too "non-bovine derived." It took a lot of self-control not to lick that plate clean, I tell you. Service was warm, genial and generally efficient. 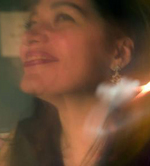 One small oversight was remedied right away, and always with a smile. The proprieter took a moment to welcome us, and thank us for coming in, and made sure to say goodnight to us as we left. 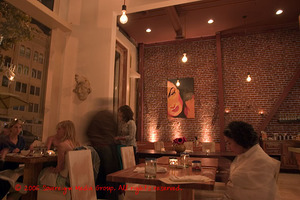 Tamarindo is a wonderful addition to downtown Oakland; we already have our return visit planned. I honestly, genuinely hope Tamarindo makes it on this quiet little street. Just don't everyone rush there at once -- don't forget, there are only 25 seats. And I'll be sitting in one of them.